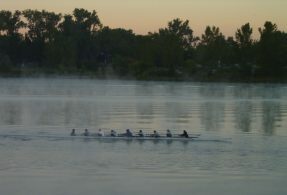 Carter Lake is a rare, urban recreational resource for the Omaha metro area. 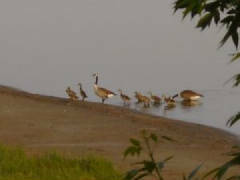 Located directly west of Eppley airport and about 2 miles from the downtown area, Carter Lake is the first vista visitors see when they arrive in Omaha. It is also an important recreational green-space for the growing number of urban dwellers in the downtown Omaha area and nearby Creighton University. The area provides a green belt that softens the urbanized and commercial areas of the Northeastern part of the city. The Lake area offers a significant amount of park areas, public fishing access and picnic areas. Boaters can enjoy skiing, PWCs, and fishing from 2 public dock facilities. Water from the surrounding area flows into Carter Lake, creating a natural catch basin for storm runoff and melting snows. Existing so close to an urban area, the lake has a fragile ecological balance with man ... and depends on help from man to maintain that balance. Eagles regulary visit Carter Lake during their annual migrations. 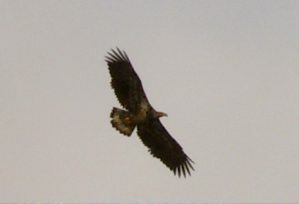 It's not uncommon to see 15 to 20 eagles soaring above the lake in the winter. Ducks, geese, swans, muskrats, amphibians, and of course, fish call Carter Lake home. Need Directions to the Lake? Click on this link.